Escape From Daily Grint Ramada Hotel Dresden. Escape From Daily Grint Ramada Hotel Dresden. Take time out with the RAMADA Hotel Dresden City! Take advantage of our attractive offer and discover the beauty of Dresden, the city on the Elbe: The DVB day ticket takes you to top highlights in the city centre such as the Semperoper and the Zwinger (Bailey). Then go to castle Pillnitz and marvel at the "blue wonder". In our hotel's TOP FIT CLUB, you can let your soul drift and end the exciting day in the sauna and jacuzzi. The hotel offer includes: 3 nights in a beautiful hotel room. daily breakfast buffet. 1 bottle of water per room on arrival. free use of the wellness area for the whole stay. welcome drink in our "Piccolino" bistro bar. speciality buffet on the 1st evening. Dresden on your own initiative: Day ticket for use public transport for 2 days. Best price offer: From 159 €. Zoo Package City Inn Hotel Leipzig. Zoo Package City Inn Hotel Leipzig. The zoo Leipzig is a real highlight for the whole family. Heidi, the opossum can be seen in the Gondwanaland tropical experience world. In the City Hotel Leipzig Inn you will find recently renewed comfortable hotel rooms. The hotel is situated close to a beautiful park and is surrounded of many restaurants and cafés. This Leipzig hotel deal offers: 2 nights in a comfortable hotel room in Leipzig. Delicious breakfast. Ticket for the zoo of Leipzig. Ice cream. Best price offer: From 77 €. Cultural Highlights in Kassel Days Inn Kassel Hessenland. Cultural Highlights in Kassel Days Inn Kassel Hessenland. Discover the great varieties of cultral Kassel: unique exhibitions in the whole city, impressive ambience in the “Bergpark Wilhelmshöhe”, which was inscribed on the World Heritage List in June of 2013 with the Hercules and the waterworks. With this hotel deal of Days Inn Kassel Hessenland Kassel you will enjoy and experience the highlights of Kassel. The hotel is situated close to the mountain park and close to the pedestrian zone in teh city centre. Direct transport links to the “Bergpark” iyou will find in opposite of the hotel. A rewarding city trip into the middle of Germany! This hotel deal in Kassel offers: 1 night in a double room of the hotel. Breakfast. 1 Welcome Drink. Information and map of Kassel. Kassel Card for 24h ( to use public transport , as well as many discounts of the attractions of Kassel). 1 lunch for your excursion. Complimentary WiFi internet access. Best price offer: From 109 €. Discover and Explore Mannheim Wyndham Mannheim. Discover and Explore Mannheim Wyndham Mannheim. Experience the trendy lifestyle of Mannheim. Discover the unique bars, clubs, pubs and restaurants in the area. Take a shopping tour through different shops and boutiques, just around the corner from the Wyndham Mannheim. The hotel deal in Mannheim includes: 2 nights in Mannheim (Arrival on Friday or Saturday). Enjoy our balanced breakfast buffet. A selection of fruits from the region. 10.- € shopping voucher “Engelhorn Shopping Center”. Children until 12 years stay free in parents' room. Free Wi-Fi access during your entire stay. Best price offer: From 119 €. Holiday Inn Berlin City East Grand City Hotels. Holiday Inn Berlin City East Grand City Hotels. True to the hotels' motto "Tipically East - Typisch Ost" we offer this hotel deal in Berlin East. The hotel deal offers a 2 nights accommodation, a balanced breakfast buffet, parking spaces at the hotel, a free room upgrade and you will enjoy a dinner in our restaurant “Grenzlos” a 3-course menu “Typisch Ost” in the evening of your arrival. You have endless opportunities to discover the capital of Germany, Berlin and the possibility to take some pictures with the iconic Trabi car. The hotel deal offers: 2 nights accommodation in a comfortable hotel room. Balanced breakfast buffet. Welcome drink Berliner Weiße tipical Berlin wheat beer with sirup. Free parking at the hotel. Free Upgrade on a higher room category. Dinner in our restaurant “Grenzlos” – 3-course menue “Typisch Ost”. Vacation memories: “Trabi-picture”. Best price offer: From 106 €. Berlin Weekend Package Grand City Hotels. 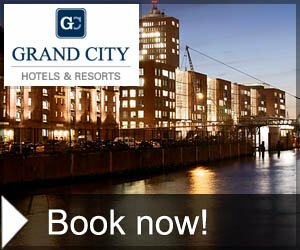 Berlin Weekend Package Grand City Hotels. The Berlin hotel deal offers: 2 nights in a nice hotel room at Days Inn Berlin West Hotel. Breakfast buffet. Berlin Welcome Card for 48 hours all transport facilities for 2 persons. I am a Berliner. Berlin Mark Hotel. I am a Berliner. Berlin Mark Hotel. Stay 2 nights in our Berlin Mark Hotel which is located right next to the old West Berlin city center the Kurfürstendamm and learn to love the spirit of Berlin s lifestyle. The hotel deal in Berlin offers: 2 nights accommodation in a standard double room with air condition. Our extensive and healthy breakfast buffet. A traditional Berlin souvenir. Berlin Souvenir Best Western Euro Hotel Berlin. Berlin Souvenir Best Western Euro Hotel Berlin. The hotel offer in Berlin includes: 3 overnights in comfortable hotel room. Breakfast buffet with panoramic view over the roofs of Berlin. 1 Berlin souvenir. 1 Lunch package on day of departure. Grand City Hotels! Over 100 Hotels in Europe - Best Price Guarantee! !